Tieline's award winning Genie Distribution is the world's most powerful DSP-based IP audio codec for multipoint audio distribution over a wide range of wired and wireless IP networks. Designed for the latest digital IP broadcast networks, Genie Distribution is the most feature-packed audio distribution codec with multiple levels of power, audio and network redundancy. Genie Distribution is the world’s most powerful audio codec for IP audio distribution applications. It also supports a range of innovative solutions over connection transports including IP, ISDN and POTS. 6 x mono bidirectional connections. Genie Distribution IP codecs have multiple levels of power, audio and network redundancy. 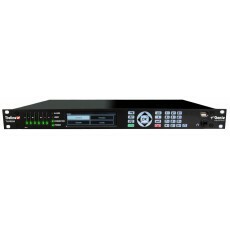 The codec features dual Gigabit Ethernet ports, dual internal power supplies, automated audio silence detection and IP network backup solutions to ensure you’re always on the air. An automated network failure detection feature provides switching to a backup IP LAN connection. You can also fail over to backup ISDN or POTS connections as required using optional ISDN or POTS modules. Hardware bypass of audio inputs to outputs if power fails. As an IP audio pioneer, Tieline was the first major codec manufacturer to integrate SmartStream features such as Automated Jitter Buffer management, Forward Error Correction (FEC) and error concealment techniques in all IP codecs. These features dynamically respond to variable conditions over unmanaged IP networks like the public internet to ensure reliable streaming. Now SmartStream PLUS has revolutionised IP broadcasting by delivering the rock solid and reliable STL-grade audio quality you would expect over a T1/E1 link by using inexpensive unmanaged IP networks like the internet for STLs, audio distribution and remotes. Some other manufacturers charge thousands of pounds for IP management software like SmartStream PLUS as if it's an optional extra. However Tieline believes high performance and STL-grade rock-solid reliability is an essential part of each and every broadcast, and delivers its renowned SmartStream PLUS as standard in Tieline Genie Distribution. Stream simultaneous redundant data streams and deliver seamless redundancy by switching back and forth, without loss of audio, from the nominated primary data link to the backup link if one fails and then subsequently recovers. Note: Use IP links from two different IP network providers for optimal redundancy over mission critical STL connections. When multiple redundant audio streams are sent, the decoding codec automatically reconstructs audio into a perfect single stream on a first packet arrived basis to ensure audio integrity. Genie Distribution is capable of 24bit 96kHz low latency linear PCM audio, delivering unsurpassed sonic clarity. The codec also features a full complement of professional algorithms including the low delay and cascade-resilient E-apt-X algorithm, as well as the popular LC-AAC, HE-AAC v1 and v2, AAC-LD, AAC-ELDv1 and v2, Opus, MPEG Layer II, Tieline Music and MusicPLUS, G.722 and G.711 algorithms. Genie Distribution also supports up to 6 simultaneous streams of Opus encoding. Tieline Genie Distribution codecs deliver flexibility by allowing you to connect over ISDN, POTS or IP networks as required. Simply purchase optional ISDN G5 or POTS G5 modules, insert them in the codec and you are ready to connect over ISDN, POTS or IP on demand. Genie supports both IPv4 and IPv6 (Dual Stack) protocols, so broadcasters can be assured that they have made a smart investment for the future as new networks and technologies emerge over time. Connect over IP with any SIP-enabled IP codec brand that supports the EBU N/ACIP tech 3326 standard, as well as VoIP telephone devices supporting G.711 and G.722. Robust DSP-based architecture designed for mission critical STL audio. 24 Bit 96kHz audio sampling (32kHz audio quality). Analogue and Digital (AES3) inputs and outputs: Up to six channels of balanced audio in/out via XLRs and DB-25 audio expansion connector (analogue or digital AES3). Bidirectional Mono, Stereo or dual mono connections. Distributing up to 6 bidirectional channels between two codecs. 3 x bidirectional stereo connections. 2 x stereo and 2 x mono bidirectional connections. 1 x stereo and 4 x mono bidirectional connections. Simultaneously distributing one, two, three or six separate IP multi-unicast audio streams to a maximum of 60 endpoints in total. Broadcasting up to 6 separate IP audio streams in multicast server mode and distributing each of these streams to unlimited endpoints over compatible IP networks. Uncompressed PCM audio plus the low-delay, cascade resiliant aptX® Enhanced algorithm. Other popular algorithms including LC-AAC, HE-AAC v1 and v2, AAC-LD, AAC-ELDv1 and v2, Opus, MPEG II, MPEG Layer-3, Tieline Music and MusicPLUS, G.722 and G.711. Dual 1 Gigabit (10/100/1000) Ethernet ports support automatic switching for redundancy. Connect over Wi-Fi using USB Wi-Fi dongles. Primary and backup audio over IP, ISDN* and POTS*. Automated failover to backup connections. Support for up to 4 output audio source fail over options. Fuse-IP network bonding (data aggregation) of Ethernet ports or Ethernet and Wi-Fi. SIP (SDP) compatible with EBU N/ACIP 3326 for interoperability with other codec manufacturers. Deterministic SIP answering and call routing: Configure up to 6 SIP accounts and connect up to 2 SIP interfaces. Compatibility over ISDN with Worldcast, Prodys, Mayah, CDQ Prima, AETA, AEQ, Orban and more. Compatibility over ISDN using aptX Enhanced encoding with Worldcast, Prodys Prontonet and Mayah. Selectable fixed or automatic jitter buffer: 5 automated settings available to manage network connectivity and avoid dropouts (includes configurable min and max buffer settings). Configurable Forward Error Correction (FEC). Highly advanced error concealment strategies. Real-time IP connection packet statistics. Real-time POTS line quality and IP link quality displayed. Support for Line Hunt dialing/answering and caller IDs using Tieline IP. Full hardware front panel interface including navigation, LCD display, PPM meters and dialing key pad. User-friendly HTML5 Toolbox Web-GUI enables codec configuration and control remotely over WANs. Toolbox Scheduler supports loading/unloading, connecting and disconnecting programs. Auto switching, dual redundant internal AC power supplies. IPv4 & IPv6 compatible and ready. Integrated alarm management including automatic silence detection. Low latency in-band RS-232 aux data channel. Configurable software rules engine via web-GUI for Control Port (4 inputs/outputs) functions, plus WheatNet-IP LIO compatibility. Upgrade firmware from USB sticks. Backup and restore configuration via USB sticks. Automated firmware upgrade notifications via Web-GUI. Support for multiple languages: English, Spanish, Portuguese and French. Backward compatible with all Tieline IP codecs. User name and password protection of codec and Toolbox Web-GUI. Support for SSL Security Certificate installation. SIP Whitelists and Blacklists allow filtering of SIP URIs and User Agents. MPEG Layer-3 audio coding technology licensed from Fraunhofer IIS and Thomson Licensing. Copyright © Preco Broadcast Systems Ltd 2019.